Although dial-up Internet connections aren’t as common as they once were, many people still rely on the phone lines to get on the Web. Windows Vista uses a modem to connect with the Internet over the phone lines. Understanding how to set up a modem gives you the control you need to be able to make updates or corrections to your existing modem. Choose Start→Control Panel→Hardware and Sound→Device Manager and then click the plus sign to the left of Modems. 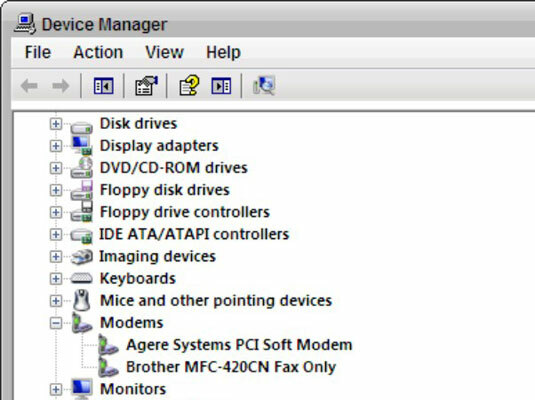 The Device Manager window will then display all the currently installed modem devices. Right-click a modem and choose Properties from the shortcut menu. The Modem Properties dialog box. Speaker Volume: Use the Speaker Volume slider to control the dialing sounds you hear when the modem operates or to simply turn it off. 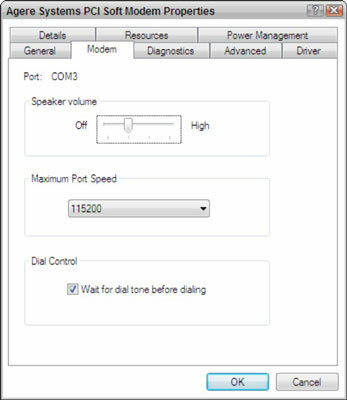 Maximum Port Speed: This setting determines the speed at which programs can send data to the modem. This is usually set at the correct number when you install the modem, but if you know that there is an error, you can select the correct speed from the drop-down list. Dial Control: Make sure that this check box is selected so your dialing attempts pay off. Driver Details: View specific file details about the modem and its driver. Update Driver: Upgrade to a newer version of the modem’s driver. Roll Back Driver: Takes you back to the previous driver in case the upgrade fails. Disable: Turn off the selected modem. Uninstall: This button removes the modem’s driver. You should be very careful about uninstalling a modem’s driver. Until the correct modem driver is reinstalled, the modem won’t work. So, unless you really know what you’re doing, don’t mess with this option. Click OK to save your settings and return to the Device Manager window.